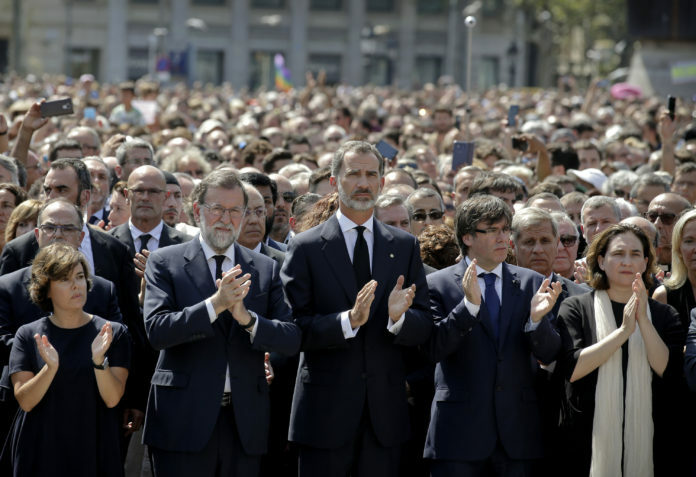 King Felipe IV, PM Mariano Rajoy, regional president Carles Puigdemont and deputy-PM Soraya Saez de Santamaría led the minute of silence gathering at Barcelona’s Plaza de Catalunya at midday to show solidarity towards the victims of yesterday’s terrorist attack. The event, attended by thousands, ended with the shout: ‘No Tengo Miedo’ (I’m Not Affraid). The number of victims has increased to 14 this morning as one of those critically injured yesterday died in hospital.